Guru Gautam Steels is relatively engaged in offering good quality of the Pipe Cap. The pipe cap is mainly used for waterproof connections. Also, they are widely used in plumbing apparatus of water supply lines, processing tools, and machinery. In a well-equipped manufacturing firm the product is produced by making effective use of the latest technology, modern toils and high quality of the alloy. As per the demand of various critical industrial, residential and commercial sector applications, it is offered in wide comprehensive range. The product has become high in demand because of various attributes. Think about your needs and accordingly place order to buy pipe cap. 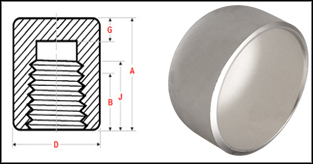 Stainless Steel Forged Pipe Cap : ASTM A182, ASTM / ASME SA 358, ASTM / ASME SA 312 GR. TP 304, 304L, 304H, 309S, 309H, 310S, 310H, 316, 316TI, 316H, 316LN, 317, 317L, 321, 321H, 347, 347H, 904L. Copper Alloy Steel Forged Pipe Cap : ASTM / ASME SB 111 UNS NO. C 10100, 10200, 10300, 10800, 12000, 12200, 70600, 71500.